We all knew that Green Bay Packers quarterback Aaron Rodgers was playing hurt last season, but Tuesday, Rodgers revealed the extent of his injuries. Rodgers told ESPN Wisconsin in Milwaukee that he played with a sprained MCL and a tibial plateau fraction in his left knee. 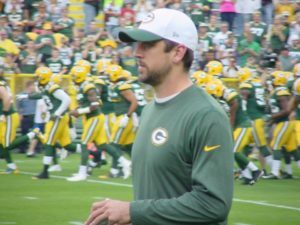 Rodgers told the “Wilde and Tausch” show that he suffered the injury in the first half of last seasons opener against the Chicago Bears. The fracture is a break of the upper part of the shinbone and it left Rodgers playing at less than 100-percent for the rest of the season. Rodgers said he opted for “a series of shots” in his knee instead of surgery. While Rodgers started all 16 games, he left the season finale against the Lions after suffering a concussion early in the game.